On your first visit to our office you will be welcomed as a member of our family and our receptionist will greet you with a warm smile. You will then be asked to fill out our required Final Forms which will help us gain some information about you and your health condition. To better analyze and evaluate your spine and nervous system we will ask men to remove their shirt and women to wear a long thick gown. Your evaluation will include: visualization, thermography (heat reading using a nervo-scope), static palpation, motion palpation, x-ray analysis, and patient interview to gain a better understanding of your condition. After compiling all of the findings Dr. Vanderbilt will narrow down the key areas to adjust and which ones to leave alone. He will fully discuss your x-rays and questions you may have. along your spine and indicates possible areas of nerve pressure. muscles/spasms which is another sign of a problem area. spine moves. If a segment feels stuck this may indicate a problem area. Most of our patients begin to notice results within the first 2-3 adjustments. Our specific and gentle adjustment relieves nerve pressure allowing your body to begin healing and promotes innate wellness. 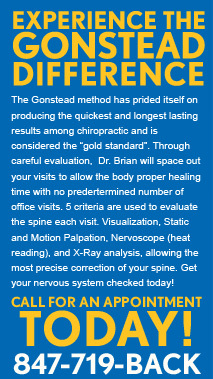 The Gonstead technique is a specific adjustment to only the affected areas and does not use twisting or rotation to correct the affected areas. It is gentle enough for kids (they love us), yet it is able to restore function and movement for the athlete and senior. Chiropractic adjustments are individualized and specific. Future appointments are not pre-determined (i.e. 3 times per week for 12 weeks). Through careful evaluation each visit we will space out your visits to allow the body proper healing time. After your initial 2-3 visits Dr. Vanderbilt will have a better idea of how your body is responding to adjustments and will recommend future appointments accordingly. Just like your regular workout at a gym, each visit builds on the ones before so it is crucial to keep your next appointment. Miss a visit and you can lose the momentum necessary to make needed changes. Our office participates in many insurance plans. We also accept auto accidents and worker’s compensation cases. To find out if your insurance covers chiropractic care, you may call our office at 847-719-BACK and we will be more than happy to call your insurance company or you may schedule your complimentary consultation. Chiropractic care is very affordable even for patients who have little or no chiropractic insurance coverage. Flexible payment programs may be arranged.